What's it like to work on a great software development team facing an impossible problem? How do you build an effective team? Can a group of people who don't get along still build good software? How does a team leader keep everyone on track when the stakes are high and the schedule is tight? 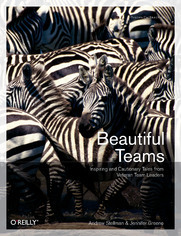 Beautiful Teams takes you behind the scenes with some of the most interesting teams in software engineering history. You'll learn from veteran team leaders' successes and failures, told through a series of engaging personal stories -- and interviews -- by leading programmers, architects, project managers, and thought leaders. Beautiful Teams is edited by Andrew Stellman and Jennifer Greene, veteran software engineers and project managers who have been writing bestselling books for O'Reilly since 2005, including Applied Software Project Management, Head First PMP, and Head First C#. "You Realists Can Stay the Hell Out of Our Office!" Can We Have a Private Office? Is Email a Boost or a Hindrance? Test Before Coding? Are You Mad? 27. Speed Versus Quality: Why Do We Need to Choose? Only Pawnin Game of Life, or "What's a Dazzling Urbanite Like You Doing in a Rustic Setting Like This?" CMM Level Subzero, or "Processes, We Don't Need No Stinking Processes!" The Brown Hole, or "I'd Say You've Had Enough"
Some of These Envelopes Contain Stock Options, or "I'm Through Being Mr. Goodbar, the Time Has Come to Act and Act Quickly"
The Blitz, or "Break's Over, Boys, Don't Just Lie There Gettin' a Suntan"
Our Invite to the Number Six Dance, or "What Is It That's Not Exactly Water and It Ain't Exactly Earth?" Epilogue, or "Nowhere SpecialI Always Wanted to Go There"